"There's one in every family." Hello, Washington! It's the height of election season in Washington State and Mike (Chris Farley), accompanied by adept campaign strategist Steve (David Spade) and the punctual Sgt. Drake Sabitch (Jake Busey) are trying to help the best man win! This team sets out to canvass Garfield County, but they are distracted in as many comedic ways as the Pacific Northwest has trees...and snakes. Distributing buttons and flyers just won't cut-it for these characters. They set buildings on fire, scare the elderly, cause an avalanche, crash an MTV party, lead the police on a high speed chase, and even surprise the Governor herself. As certain people scheme to rig the election, Mike must find a way to alert authorities to the fraud without causing a family rift and lengthening his own police record. The countdown to Election Day nears and no strategy for gaining votes is off-limits. 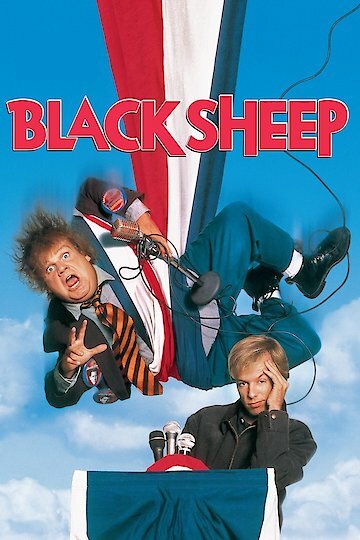 Black Sheep is currently available to watch and stream, download, buy on demand at Hulu, Sling, Amazon, Vudu, FandangoNow, iTunes, YouTube VOD online.